Neal Melton has been exploring Tahoe underwater for over 40 years. 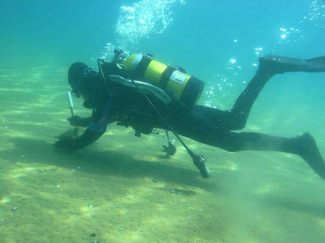 As beach cleanups go on along Tahoe’s shoreline following the Fourth of July festivities, down below the lake’s surface a scuba diver is busy cleaning up another mess. 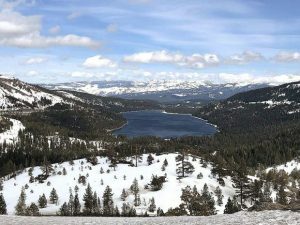 Neal Melton has been hired to clean up underwater after fireworks displays on the South Shore for over 30 years, starting back when Harrah’s put on the event, then Lake Tahoe Visitors Authority and now Tahoe Douglas Visitors Authority. This year it took Melton just eight dives in the waters near Edgewood Tahoe. In addition to debris from the fireworks, which are set off from barges in the lake, Melton said the number one thing he finds is beer bottles. Unlike on the beaches where pieces of plastic and cigarette butts are the top two types of litter cleaned up by volunteers, Melton said he rarely sees any plastic underwater. “The most unique thing I’ve ever found underwater was a boat life jacket,” said Melton. Melton has been diving since he was 18-years-old and lived near Laguna Beach. Inspired by the movie “Sea Hunt” and ocean explorer Jacques Cousteau, he spent his youth hanging around the dive shop waiting until he was old enough to take his first plunge. After that, he was hooked. To date Melton’s dived in Florida, Fiji, Mexico, Bonaire, the ABC islands near Venezuela, and Honduras. In 1976 he moved to Lake Tahoe and started diving right away. “Cave Rock was my first time. The water temperature was about 42 degrees. Just freezing,” said Melton. He became fascinated with how the lake was formed. 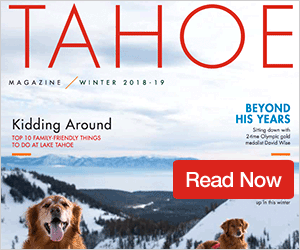 He spent 21 years as a dive instructor here on the South Shore, and during that time he dove down into Tahoe’s cold waters anywhere from 300 to 400 times a year. Though Melton doesn’t dive nearly as much as he used to, he can’t picture himself stopping anytime soon.